first moon is an Arts company that specializes in sound. Founded by composer Ian Vine in 1998 as a studio, it has grown to encompass the various aspects involved in presenting his work publicly. The principal concept behind the first moon ensemble is to present music outside traditional concert venues in spaces such as galleries. The instrumentation and players are not fixed and could consist of flute and electronics to a massed ensemble of forty guitars. 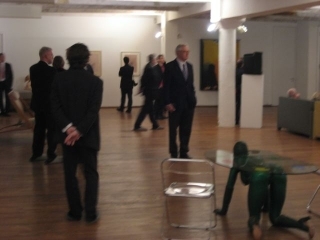 first moon gave its debut concert in March 2008 at the Sammlung Hoffmann, a private art collection housed in a former factory in Berlin-Mitte. In a co-presentation funded by the Sammlung Hoffmann, they gave the world-premiere of a specially designed work by Ian Vine for flute, horn and cello with multi-channel electronics. In ohne titel (2008), the instrumentalists are placed in different areas and the audience is free to move around the space experiencing different versions of the piece. The musicians involved in the debut concert were: Jennifer George, flute; Johann Friedrich Brockdorff, horn; and Anna Carewe, cello.